Mercy Housing Management Group (MHMG) was established in 1983 to provide property management services for Mercy Housing’s affordable housing communities. Today, MHMG manages hundreds of properties across the United States for multiple ownership groups with a wide variety of product, regulatory and population types. MHMG is a proven leader in the national market for affordable housing property management. With regional management offices located in five cities across the nation, MHMG offers a national support structure in Denver, Colorado which includes: real estate accounting, compliance, insurance, information technology, human resources and resident services. MHMG currently manages over 300 properties serving 22,500+ affordable apartment homes in 21 states including Arizona, California, Colorado, Florida, Georgia, Idaho, Illinois, Indiana, Iowa, Kansas, Kentucky, Missouri, Nebraska, North Carolina, Ohio, South Dakota, Tennessee, Texas, Utah, Wisconsin and Washington. With over 30 years of experience and a strong local and national presence, MHMG is the best choice for managing your properties. 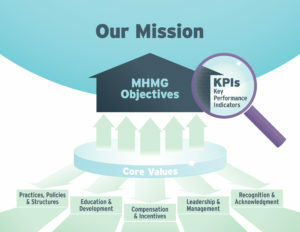 Operational Excellence is a consistent, measurable and systematic approach to the various components of Mercy Housing Management Group’s (MHMG) structure and on-going business model, including Standardized Practices (Policies and Procedures), Educational Programs, Pay and Incentive Compensation, Management and Financial Oversight and Employee Recognition. By following the principles and guidelines of Operational Excellence, onsite staff can focus on achieving results. Operational Excellence includes a compilation of policies and procedures ranging from Operations and Administration to Maintenance and Human Resources. The following model shows the basic structure and components of the Operational Excellence. In order to achieve the management objectives, MHMG focuses on certain Key Performance Indicators as a measure of success. The Key Performance Indicators are driven through the five systematic components of the Operational Excellence structure. Interested in Partnering With Mercy Housing?